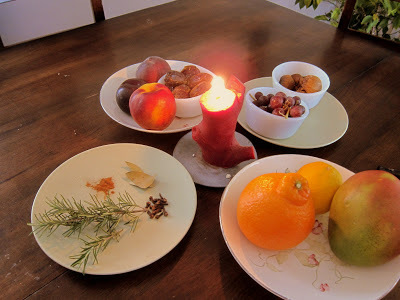 Tonight starts Shevat 15 according to the Hebrew Calendar, thereby making it Tu B’shevat. We rounded up fruit yesterday and today has been a fun day of tree recognition around our home. Later we’ll enjoy a dinner that revolves around reading scriptures, thinking about the trees and the providence we are offered. It’s a less well known but enjoyable holiday that gives us a chance to take it easy and splurge on non-local, unseasonal fruits that we tend to avoid in these cold months of winter. It’s about Israel’s produce, the Land of Milk & Honey, not so much about here–though we are using one of our own Meyer Lemons! click on the picture to see the directions. To commemorate we created this tree decor. A simple project that started yesterday with the painting of the big sheets of watercolor paper. That was fun for everyone, we even had a chance to talk about mixing colors. Now we’re just waiting for Drew to trace and cut out his hand so the tree will be complete. What a beautiful celebration, "a new year for trees." Definitely something to be commemorated, I love the four plates idea. Cool! I look forward to reading more posts on celebrations around the Jewish calendar. So very beautiful! Thanks for your post. I really appreciate it. I'm going to check out the guide you used for the table setting. Lovely! I love these rituals. So important- especially when we get the children involved. we had such a great time. Friends came over and it truly was a laid back celebration–i think everyone was surprised at how much fun a little organized commemoration can be on a weeknight! That's beautiful, Lacey! I especially love the sorting of tree fruits. What a great commemoration for the trees!